In-Database processing where SAS data quality and analytical processing occur within the data source, minimizing data movement and leveraging the native language of the data source. Grid computing to distribute processing over a number of computing nodes in a cluster. High Performance Analytics where in-memory calculations are processed across the nodes of a cluster including High Performance Risk and High Performance Data Mining. In-memory Visual Analytics and Visual Statistics powered by the SAS LASR analytic server. 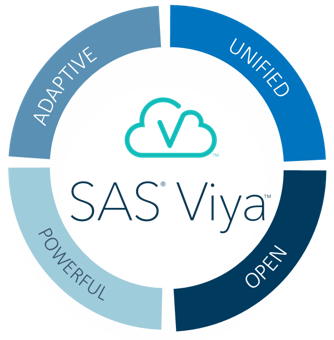 SAS Viya introduces Cloud Analytic Services (CAS) and continues this story of high performance computing. 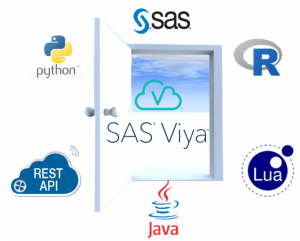 CAS is the runtime engine and microservices environment for data management and analytics in SAS Viya and introduces some new and interesting innovations for customers. CAS is an in-memory technology and is designed for scale and speed. Whilst it can be set up on a single machine, it is more commonly deployed across a number of nodes in a cluster of computers for massively parallel processing (MPP). The parallelism is further increased when we consider using all the cores within each node of the cluster for multi-threaded, analytic workload execution. In a MPP environment, just because there are a number of nodes, it doesn’t mean that using all of them is always the most efficient for analytic processing. 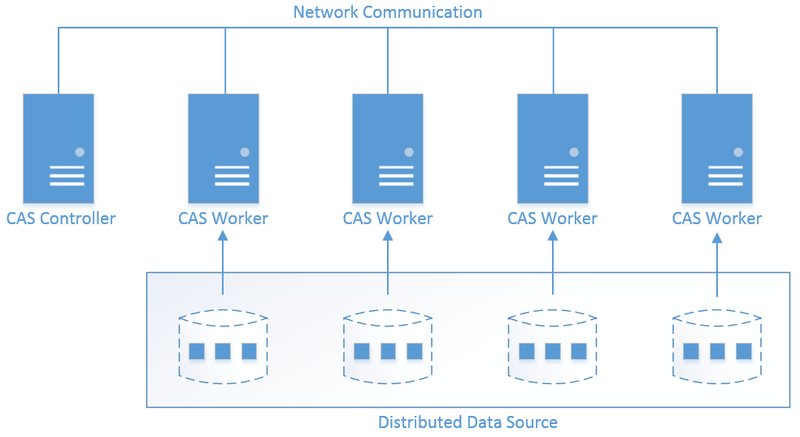 CAS maintains node-to-node communication in the cluster and uses an internal algorithm to determine the optimal distribution and number of nodes to run a given process. However, processing in-memory can be expensive, so what happens if your data doesn’t fit into memory? Well CAS, has that covered. CAS will automatically spill data to disk in such a way that only the data that are required for processing are loaded into the memory of the system. The rest of the data are memory-mapped to the filesystem in an efficient way for loading into memory when required. This way of working means that CAS can handle data that are larger than the available memory that has been assigned. The CAS in-memory engine is made up of a number of components - namely the CAS controller and, in an MPP distributed environment, CAS worker nodes. Depending on your deployment architecture and data sources, data can be read into CAS either in serial or parallel. When data are read in parallel from the source system into CAS, both large and small files are loaded into memory as fast as possible for optimum performance. What about resilience to data loss if a node in an MPP cluster becomes unavailable? Well CAS has that covered too. CAS maintains a replicate of the data within the environment. The number of replicates can be configured but the default is to maintain one extra copy of the data within the environment. This is done efficiently by having the replicate data blocks cached to disk as opposed to consuming resident memory. One of the most interesting developments with the introduction of CAS is the way that an end user can interact with SAS Viya. CAS actions are a new programming construct and with CAS, if you are a Python, Java, SAS or Lua developer you can communicate with CAS using an interactive computing environment such as a Jupyter Notebook. One of the benefits of this is that a Python developer, for example, can utilize SAS analytics on a high performance, in-memory distributed architecture, all from their Python programming interface. In addition, we have introduced open REST APIs which means you can call native CAS actions and submit code to the CAS server directly from a Web application or other programs written in any language that supports REST. Whilst CAS represents the most recent step in our high performance journey, SAS Viya does not replace SAS 9. These two platforms can co-exist, even on the same hardware, and indeed can communicate with one another to leverage the full range of technology and innovations from SAS. 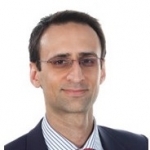 To find out more about CAS, take a look at the SAS Cloud Analytic Services 3.1 Fundamentals. If you would like to try out some of the new capabilities, check out the early preview trial. Or, if you would like to explore the capabilities of SAS Viya with respect to your current environment and business objectives speak to your local SAS representative about arranging a ‘Path to SAS Viya workshop’ with SAS. Many thanks to Fiona McNeill, Mark Schneider and Larry LaRusso for their input and review of this article. Great blog. Looking forward to you or one of you pen pals to follow up with a blog about some of the algorithms that have been rewritten in CAS to take advantage of this scaling architecture. Along with some examples of where they change the game for problems that are often unsolvable when limited to an SMP architecture. Hi Keith, thank you for your kind words and feedback. I'm excited by the possibilities that CAS offers and look forward to blogging further on this subject!